Curiosities, stories and helpful info for everyone who likes to travel and making friends during it. Interview with user: he met his girlfriend in Taptrip! For today`s post I made an interview with Christian Comia, a Taptrip user from Batangas, Philippines. While many people meet new friends in Taptrip, Christian is got more than this: he met his girlfriend in Taptrip! Although he lives in Philippines and she lives in Chile, they started a virtual relationship since September 5th. During this interview, he tells a little more about how it happened as well as other experiences regarding Taptrip. Ivan (Taptrip): How did you and your girlfriend meet via Taptrip? During a virtual tour? Christian: No, was not during a virtual tour. She added me. Ivan (Taptrip): Did you decide where you will meet in person for the first time? Christian: Yes. I want to go to Chile. Ivan (Taptrip): Have you met any other friends in Taptrip? Where are they from? Christian: Yes. I've a friend from Hungary and a friend from Armenia. Ivan (Taptrip): Could you tell what you learnt from the cultural exchange via Taptrip? Christian: I like different culture, it's very nice. I learnt to respect each other and other persons' traditions. Ivan (Taptrip): How would you recommend Taptrip to a friend who does not use it yet? Christian: I recommended them to install Taptrip to know different cultures and different countries. And if you also want to know different cultures, different countries, make new friends and, who knows, find a love just as Christian did, download Taptrip for Android or iPhone and have a lot of fun! Download Taptrip App and make friends in more than 200 countries worldwide! Download Android Version on Google Play! Download iPhone Version on App Store! Interview with user: he made good and loyal friends through Taptrip. 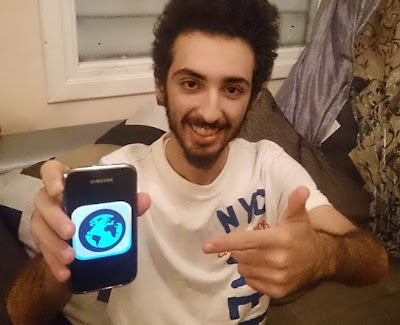 For today's post I made an interview with Nick Larson, an active user of Taptrip who lives in Rabat, Morocco. He has made countless friends with the app and found out interesting things about other cultures. Below he tells a little more about his experience. Ivan (Taptrip): Which points do you like most in Taptrip? Nick: The point that I like more in Taptrip is I can meet new people from all over the world and talk to anyone that I want to know. Ivan (Taptrip): How many friends did you make through Taptrip? Nick: I made a lot of good friends in Taptrip, I can't count them because they are to many. But, those are the best and loyal friends that I knew since my first time in Taptrip. It's about 10 good friends. Ivan (Taptrip): Which countries are these friends from? Nick: I have five friends from Japan, three from Indonesia, one from USA and one from Hong-Kong. Ivan (Taptrip): Could you tell us something interesting regarding your Taptrip experience? Nick: When I talk to people from different countries, I noticed that they have different ways of thinking, different ideas and different behaviors. And the most interesting thing is we can exchange our ideas, tell about our routine, share it, know more how people live in their countries. And you can know people from the whole world and have great experiences too. Only need to download Taptrip for your Android or iPhone. And if you already have an interesting story regarding Taptrip that you would like to share, please tell us! Taptrip wants to hear from you and write about you! Why do many japanese dye their hair to brown, red, blonde...? I started to be interested in japanese culture since childhood. My first introduction to it was through 70's and 80's movies. The first thing I noticed was everyone had black hair, except for the old people. Of course it sounds obvious, but when we are three years old it's a big surprise to know that all asians have black hair. But, a bigger surprise happened when I started to watch movies from 90's to nowadays. The black hair of japanese people have suddenly become brown, red, blonde, all the collors! And I asked myself why. Why are japanese people dyeing their hairs? Well, if we take a look at the celebrities, we can get the answer: it's fashion! I don't know who started it, but now everyone wants to do it - specially young people - because it looks cool. I've many friends in Japan with colored hair, maybe much more than the ones with original black hair. I've asked some of them for what reason they or people they know do it. Many confirmed it's because of fashion and because make people look younger, specially women. But, others said it's because some japanese want to look like foreigners. And the first step for it is dyeing the hair. During college I read a book that mentioned that. Ceuntries ago, when japanese gates were closed to the westerns, the beauty pattern was korean because according to japanese of that time, korean women had a delicate beauty. But, when the gates were open and the westerns started to come, the european beauty started to be more valorized. The biggest proof of that was how japanese stopped to paint theirselves as asians and started to draw their selves as caucasians like we see in manga and anime until nowadays. Some say that's why Goku, the main character of the anime Dragon Ball, was the biggest hero of Japan in 90's because he looks like a japanese - black hair - but, looks like a foreigner - blonde hair - when gets stronger. But, having colored hair is forbidden in some moments of life. High School students, for example, cannot dye the hair or even use earring. The same for some company employees. For this reason, many japanese with a different look are university students or adults who work for companies which do not prohibit them to do the same. And this maybe better. People can be more happy if can assume their own style, since it's not exaggerated. Are there people with the same fashion style in your country? So, upload some pictures off them in Taptrip! Be a guide of your country like Shotaro Kajitani! Check this interview! This weekend I went to Japanese Disney Sea for the first time and my friend Shotaro was my guide in there. He took me and other friend to many places in the park, including The Tower of Terror where we take an elevator that drops very quickly. Although it was less scared than the Role Coaster of Yokohama, I screamed very loudly the same way. The Tower if Terror in Tokyo Disney Sea, Japan. This was not the first guide work made by Shotaro. He, who studies english at Sophia University in Tokyo, was also guide in Kyoto by the chance. And now he plans to expand this work into other places. I've interviewed him to tell more about this story. This is me and my friend Shotaro. Ivan: How was the experience of being an "outside" guide in Kyoto? And how did it happen? Shotaro: It was a great experience. A couple and I became friends, we went to Kinnkaku-ji Temple, the most traditional and famous place. I explained about the temple, also explained about kimono, a traditional japanese clothing. I think many foreigners want to know about it. (...) Then, I felt the importance of explaining about Japan in english or other language. Ivan: Now do you want to apply this idea in Tokyo? How do you plan to manage this activity? Shotaro: At first my idea was applying just in Tokyo, but now I'm plannig to set branches in Tokyo, Nagoya, Osaka, Kyoto, Hiroshima and Oita. Ivan: The idea is interesting and similar to the purpose of Taptrip which users can introduce their own countries through virtual tours. What do you think about it? This is Kinnkaku-ji Temple in Kyoto. Download Taptrip and see other pictures in Japan. Yes, it does. With Taptrip app you can do the same activity Shotaro does, but using your smartphone. After installing the app, you can be the guide of a virtual tours of your country, upload pictures and info about it while chat with other users. So, if you plan to come to Japan and need someone to guide you, look for Shotaro. Until there, enjoy the virtual tours or be a guide in Taptrip and make many friends! Japanese Kimono: a traditional and stylish clothing? Last month a friend of mine came to Japan and the first thing he asked me was where he could find and dress a kimono, a traditional japanese clothing. He was very interested on it, specially after seeing this picture of mine. Did you like it? Download Taptrip and check other pictures! The day I took this picture, went with some friends to a temple where some old ladies taught us how to make a pretty ikebono (japanese flower arrangement) and then helped each of us to dress the kimono and take pictures around the temple. I never imagined would be so difficult to wear a kimono, two old ladies had to wear it on me! Anyway, was a nice experience. I think every foreigner who comes to Japan wants to wear it and feel like a real japanese. But what surprised me that summer day was seeing not just old people interested in kimono, but also young people. I was really surprised because normally young peop are not interested in traditional things. In Japan most of them don't like enka (old japanese songs), for example. But, kimono seems to be the exception of the rule. I spoke to some of those young people and they told me they usually wear yukata (a kind of "cheap and simple kimono") for the summer and kimono for special occasions like the Coming of Age Day. This date, young women who have just turned 20 years old celebrate their majority wearing very nice kimono. Some of them take a long time (like months) to choose the prettiest one. During the Coming of Age Day, japanese women dress kimono and japanese men dress suit, They can also drink alcohol for the first time (yeah, right, for the first time). So, maybe kimono is not just a traditional thing anymore, but also a stylish thing. And when traditional things become stylish, they become more expensive. The proof of that is the big money I paid only to wear that kimono for third minutes. It's the same as watching a concert of Bossa Nova in Brazil, Tango in Argentina or Fado in Portugal, for example. They are traditional music styles which became very famous worldwide and some chic places can charge a high price for a presentation, reason why I could not watch Tango when I was in Argentina. So, if you come to Japan someday, I suggest you to wear kimono just like my friend and I did. But, remember there are other traditional things you can do as drinking sake and listening to enka? Have you never heard it before? So, check this video with my favorite enka song. Available for Android and iPhone! A brief history of Sushi: why do japanese eat raw fish? Introduce your country to the world! 8 traditional events in Philippines that you can not miss out! Do you know how to use Taptrip in Android and iPhone? 3 tips to make friends online! 10 tips to get a Visa and travel anywhere. 7 hand gestures you must not use abroad!